Whatever way this year’s championship plays out, the 2012 GAA season will surely be recalled in future years because of the protracted wrangle relating to Seanie Johnston’s move from Cavan to Kildare. In his latest spin in the guest chair, John Cuffe provides his thoughts on the affair. The sun is at its yearly highest, not a cloud in the blue sky. I should rejoice but, alas, an invisible cloud has crossed my soul. A bridge has been crossed, a Rubicon challenged and defeated. The GAA for all its imperfections and unspoken nuances was the perfect repository for the native Irishman. The unsuccessful politician, the rich farmer, the poor six-acre bogman, the fisherman, the Guard, the labourer, the bank manager, hey – even the doctor and dentist all found equality of sorts within its convoluted framework. The successful teams harnessed the-cross section of the above. The unsuccessful found a place for the shopkeeper’s son, the newly arrived Guard or bank official who would never be allowed to break sweat in his native club’s jersey – because, bluntly, they were useless – found a home in a small town away from the knowing. The clubs built around families, the club inspired and fuelled by hatred – imagined or real – against the boys from over the bridge. The insult first tendered back in 1910 but still the rallying call in the dressing room a hundred years later. All this made the GAA the great beautiful ugly hulk that we are addicted to. Many fine players had their careers cut off at the knees by emigration, lack of work at home, a vindictive manager or selector. Many were used and abused as the new kid in town was tried out ahead of him. My own uncle when he finished labouring on the roads and turf cutting manned the Gweedore full-back, centre-back and midfield spot over eight county finals and six county wins. He never once was asked to make the trip to Letterkenny for the big one. His status as a Spailpín assured that. We ourselves were never less than proud of him and achievements. At nineteen John Nallen, the great John Nallen, lined out at midfield for Galway in the 1951 Connacht final against his own county Mayo. John was a bank clerk and travel was slow and costly back then so Tuam Stars and Galway benefitted. Later he was a Mayo legend and before he signed off his travels took him to the 1959 All-Ireland final with Galway. He also played midfield with Meath and as well as that played for Cavan. In doing so John put down roots in each of those counties and is fondly recalled in each of them to this day. Martin Carney came to us, in essence he came home. The son of a Lahardane man he was welcomed as a teacher and footballer. Dan O’Neill and Seamie O’Donnell went the other way to Louth and legend status. All of those men lived, worked and played for their new counties. There was no ambiguity. Kildare – a county ranked number four by those who profess to know their onions – have now got Seanie Johnston on their books. Johnston is a footballer that has class and is badly needed by his old county. Yet Kildare for all its media-driven hype have in four years beaten one team of note, a distracted and disorganised Meath. They have strayed around Division Two needing a last minute penalty to get past Galway and out. Dermot Earley, a veteran from 1998, is still a vital cog in their engine and Johnny Doyle – a former corner-forward – was their go-to midfielder last year. Wexford, with none of the hype, have done as well if not better than them. But the cognoscenti that know football see them as big, like real BIG. If I were a forward playing club football in Kildare I would throw up today. Not deemed good enough hence the clamour for Seanie. This seems to be particular to Kildare: Karl O’Dwyer, Murphy, Lacey, Sheridan and John Divilly have all donned the lily jersey despite coming from Kerry, Cork, Tipp, Meath and Galway respectively. If another county pulled a stunt like that they would be lacerated. The irony is that the two they should have kept did the deed with Cork – Tompkins and Fahy. What now? Well in essence we have come to a Bosman moment. A wall has been breached, appeals finally succeeded and the famous rock that has lumbered this nation has risen from the water. It’s called precedent. The Seanie Johnston case will now be the template for the next lad who wishes to continue his career elsewhere. Of course EU law and the various rights brigade will correctly point out that what the GAA has done over the years is probably restrictive and illegal. The parish rule will be revisited soon and it too will be dumped. Seanie wanted to play county football. Cavan didn’t want him and Kildare did. The square has been circled and a new chapter has been opened. I wish him well, a lovely young man by all accounts and I had the pleasure of seeing him play many times … top class. Still part of me sees another part of what we are and who we were stripped away. Perhaps it’s the way things are meant to be. Life does not stand still and the young players on Twitter are full of good wishes for Seanie. Maybe it’s me who needs to grow up and smell the coffee but old ways are ingrained and are hard to change. Superb piece, enjoyed the read. Got the feeling this move will not work out as hoped for Kildare or Johnston. A mercenary idology is been nurtured in Kildare. Disinchanted players are better off plugging away and sticking at it with their clubs, instead of dancing with the first slapper they see at the disco. Mayo’s Ciaran Mc can hold his head very high in this regard. I would have a certain amount of sympathy for Seanie. He was deemed surplus to requirements by Val Andrews – – does anyone seriously think there are six better forwards in Cavan? Shortly afterwards the same Val Andrews lost the confidence of the players and the County Board and had to resign. The GAA hierarchy and the Cavan County Board put all types of obstacles in Johnston’s way to prevent his transfer but in fairness to him he stuck with it and they eventually had to give way – – even though he may still have to tog out for the local hurling club in the championship to make himself eligible for Kildare footballers. Yes, John – in an ideal world maybe he would have “Knuckled down” and stayed with Cavan but there are personalities and bitterness involved so maybe it was best for all involved that he moved on. On the Kildare side – Kieran McGeeney is under huge pressure to go a long way in the Championship this year – he is running out of time – he would see Johnston as a major acquisition to his panel. Either way I would fancy Seanie and the Lilywhites will still be in the Championship race long after the men from Cavan have made their exit. Good piece, John. Personally, I’m not sure that Seanie Johnston’s move will alter all that much in the scheme of things and it doesn’t seem to break much more ground than Larry Tompkins’ move to Cork did over twenty years ago. As Samuel says, Seanie was deemed surplus to requirements in Cavan and so it’s at least partially understandable for him to want to continue to play inter-county football even if his own county don’t want him. He certainly isn’t the first footballer to find himself in this position and neither is he the first to switch counties in such circumstances. I guess the sour taste from this is that, as John points out, it’s once again Kildare who stand to benefit. While the Lillies may have lost out in the era of Tompkins and Fahy, they’ve more than made up for it with the number of players heading in the other direction from the mid-1990s onwards. All these transfers haven’t have brought Kildare much success, though, and I somehow doubt that Seanie Johnston’s addition to their ranks will change this situation in any material way. Indeed, the message it sends out to aspiring Kildare forwards – who may now be lower down in the county pecking order, thanks to Seanie’s arrival – could prove very counter-productive to the county in the months and years ahead. Just to let everyone know – Dan O’Neill came back to Mayo from Louth and wore the Green and Red of Mayo on his return. His book “Divided Loyalties” has the full story. I think all copies have been sold. His return saw him win championship with C. Bar Mitchells and he became Chairman of the Club. Seamus O’Donnell did not return to play for Mayo. Not forgetting the “Early” Wagon that moved east from the foothills of Nephin Mountain stopping at Ros before moving on to the plains of Kildare where Dermott remains a huge influence. It is hard to criticise Kildare, do you remember Enda Sheehy 2003 against Fermanagh in the qualifiers. Hi Redcol, indeed I do remember Enda Sheehy. 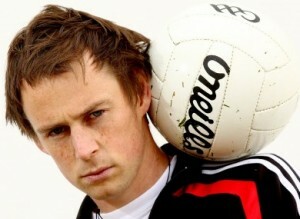 Played club league football for a year in Mayo before he got a chance with the county. Dogged with injury and unlucky. Son of a Crossmolina woman and also worked and lived in Mayo as I recall. I also recall Sean Lowry who worked for BNM and resided in Xmolina for years. Throw in Ray Niland and Dermot Flanagan as well, all with Mayo connections either through family or birth not forgetting Martin Carney. I would suggest a huge difference between those and what Kildare are up to. Actually I have no issue with Seanie Johnstone, I do with Kildare. I suppose as a county we gifted the best of players to other counties and there was never issues over their residence or entitlement . John Gibbons, John Nallen , jimmy Curran and Eddie Maguire to Meath. Dan O Neill and Seamie O Donnell to Louth. Dermot Earley, Sean Kilbride and Pat Lindsay to Roscommon.Mick Higgins was better qualified to play for Mayo as he was Cavan. Kildare to me want it do bad that they will do anything to achieve the big one. The one thing they cannot import is pedigree, either a county has it or they haven’t . John – while we are on the topic – Did you ever get the call yourself from Sean Boylan or any of his predecessors to put on the Meath colours? I know full well that your heart and soul is in your native county and that you wouldn’t dream of transferring your allegiance – – — – – but were you made any offers at all in the past??? Poor old Sean thought he got the call lately but alas it was like the cuckoos, elusive and the Boy Banty held the nest. I did get the call Samuel but it was to places like the Palm Court, Pontoon, Dermameel and Eachleam dance halls. Come to think of it…I got the call to Knock as well!! Did Brendan McLoughlin win a minor medal with Dublin in the fifties and then came to Mayo to play midfield with Bill Shannon (RIP) who later played for Sligo and Connaught? Well Peter I see that Dublin won a three in a row Minor All finals 1954-56. A Brendan McLoughlin was midfield on the ’54 team. Mayo won the minor final in 1953. Brendan McLoughlin (from WJs excellent archive) did indeed anchor midfield and various positions on Mayo senior teams from 1955 onwards. He played v Dublin in the 1955 All Ireland senior semi final. He also played with Bill Shannon and appears to have been a very good player. I have to confess I knew nothing about him but he strode the stage until 1961/62. Brendan toiled when mayo had come to the end of the golden era…anothet soldier on our ongoing quest since. Fair play to him, he seemed to have it all to function at the top. Brendan continues to play golf in The Green and Red Society and travels from Dublin for the outings. He was very disappointed with the display against Cork when I met him at Mayo v Donegal in Swinord a few weeks ago. Others who travelled and returned included Sean Reilly who played for Donegal and Ulster and returned to play for Mayo and maybe Connaught in the fifties and sixties. I cannot be sure about Jim Fleming if he played with Donegal. Paddy Prendergast played for Donegal for a year too maybe 46?? Paddy Prendergast did I think and so to did Johnny Forde , now I could be wrong the latter. Paddy played against a legendary Gweedore side whom we had a representative doing his bit. I for one would not have a problem with players moving counties provided its done in the best interest of the players involved.And provided they give a valid reason and stick within the rules set down by the gaa. I didnt see such a problem arise when B JPadden or A O’Malley or Alan Costello moved from mayo in the last few years. The whole Seanie Johnson saga is a real mess and IMO Some one along the line has not stuck to the rules. Its seems that certain people will do anthing to achieve the goals and with some counties its all about that. Hi John and Peter. Sean Reilly was my father and yes he did play for both Donegal and Ulster and Mayo and Connaught. A native of Belmullet who became a Guard and was first stationed in Millford and played club football with Downings and then picked to play for the county and province..in the early 60s. Later moved to Charlestown where he then played for Mayo and Connaught. Sadly was killed in a road traffic accident in 1998. Was always so proud of his achievements with both counties and provinces… Thank you for mentioning him Peter..
Hi John, I’ve only stumbled across this piece now, to be honest while I agree with many of the sentiments, I think (and I should say I’m a Kildare man) that you’re a little biased against Kildare. Some quick examples, you manage to criticise us for both importing players and exporting them? When a player joins Kildare, it’s our fault for poachign, when a player leaves, it’s our fault for ‘letting them go’. How does that work? The fact is that Cork poached Larry Tompkins in exactly the manner that Kildare poached Seanie Johnston. Pointing out that he moved to the county is neither here nor there – he moved for the express purpose of playing football for Castlehaven and Cork and the job and life came with it. Not the other way around, as was the case with, say, John Nallen. OK, the difference is that Johnston hasn’t moved jobs, but to me that’s a small point – both Johnston and Tompkins left to further their chances of winning something, even if Tompkins judged his chances of winning something in his new county more accurately. Let me tell you as well, the wounds from the poaching of Fahy and Tompkins still cut deep and all the Murphys and Divillys (both of whom are still heavily involved in KE football, by the way) will never make up for the loss of those two superb footballers. Don’t get me wrong – I think you’re entirely right to criticise the Johnston transfer. But you shouldn’t make out that no other county has ever been disingenuous or poached a player or that it is a Kildare policy. What it is is simply a byproduct of two high-profile outside managers. Mick O’Dwyer did the same things in Laois and Wicklow – Billy Sheehan, for example, spends hardly any time in Emo, by all accounts, while Thomas Walsh was blatantly and ruthlessly poached from Carlow. If you take the O’Dwyer and McGeeney two eras out of it – indeed, even if you include them – Kildare have still suffered much more from poaching than we have benefited from it. Anyway just thought I’d give a view from the east, best of luck to both counties on Sunday. John Forde played for Donegal while stationed for a spell at Finner camp.